Adult kayaking tours along Pembrokeshire’s stunning coastline in Wales. We provide quality adult kayaking tours along Pembrokeshire’s stunning coastline under the supervision of qualified kayak guides. On a tour, you will see the coastline from a different perspective and gain knowledge of local history and marine life. 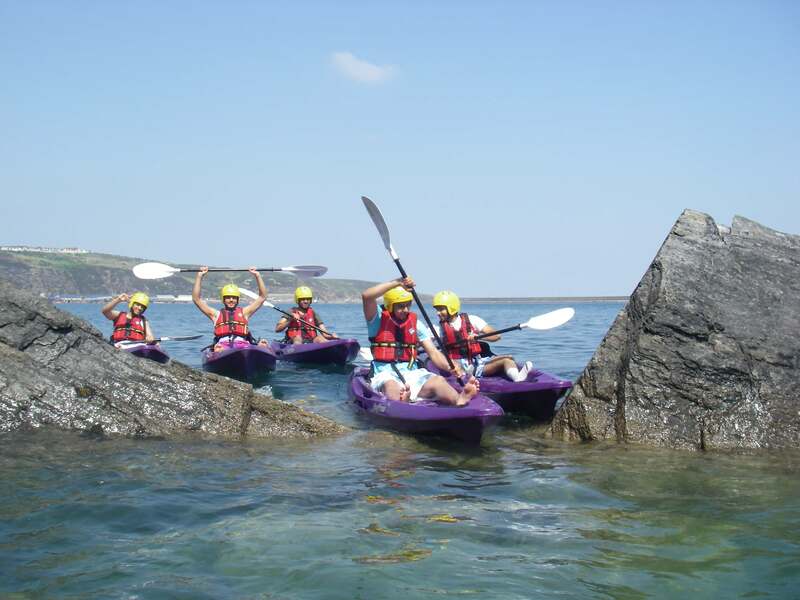 Spending time with friends while kayaking on holiday, surrounded by the calming atmosphere and beauty of the Pembrokeshire coast is an experience not to be missed! All adventures are tailored to suit your group. From stags and hen parties to groups of friends, couples and individuals, your guide will select a route with plenty of caves and marine life. All equipment to keep you warm, happy and afloat is provided. We aim to stay dry (other than the odd drip of a paddle) but some do love to have a swim. Stay dry or get wet, it’s up to you! An ideal adult kayaking activity for friends, couples & Corporate groups. On a tandem (two people) kayak, the elderly have the opportunity to reach areas of remote coastline that wouldn’t be possible under their own steam. They can assist with paddling the kayak or sit back and enjoy the ride into caves and secluded bays. Thanks to our well fitting quality wetsuits and equipment everyone can have fun while staying warm and safe. Energy levels can drop suddenly so bring snacks and drinks to avoid this. Water reflects 100% of sunlight. Sun protection is vital for everyone. We suggest a high factor sun cream on all exposed skin.